Ukraine's EuroBasket Women 2009 direct qualification ended last September when Germany beat them (73-47) in the last round of games. This victory for Germany saved them from playing in the relegation round and preserved their status in Division A. This time Ukraine, playing at home, ended the game against Germany as a contest as early as the first period. The hosts were leading (14-8) after only four minutes. Then they scored 13 unanswered points within three minutes. Before the end of the first period Germany only scored from the three-throw line as Katharina Kühn split a pair. 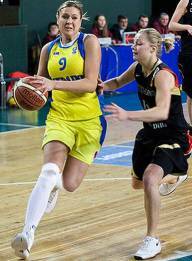 Alexandra Gorbunova (right) scored 15 points of her final total of 20 points for Ukraine as her side won the first quarter (29-11). Ukraine were never in any difficulty after this and increased their advantage by the end of the second period (48-24). Germany, without Anne Breitreiner and Dorothea Richter, did not have the firepower to trouble their hosts despite the efforts of Romy Bär who scored 21 points. Ukraine are hence 2-0 in the group and a victory in their next game against Croatia will see them through to Latvia. Belgium, playing their second game of the series, did not have the best of starts and trailed (4-0). Sara Leemans scored Belgium's first point after two minutes of play. Then Belgium managed to go in front (7-6) after a trey from Laurence Van Malderen. The lead was to change on several occasions during the first period with Italy edging the quarter (22-20). During the second period neither side was able to take command of the match. The hosts managed to get the lead back (28-24) and despite the Italians levelling the score, Belgium still had the advantage (38-33) after 17 minutes of play. Belgium started to accumulate fouls. Italy seized the opportunity to go on a 12-2 run to regain the lead and go into the interval leading (47-43). The Italians took control during the third period. With 24 minutes played Raffaella Masciadri put Italy 10 points up (55-45). Belgium were unable to bring the score down and went into the final period trailing (56-67). Then they went all out in the final period to try and save the game but their foul problems hampered their progress and Italy held on to their advantage to win (81-69). Van Malderen led the scoring with 21 points for Belgium while Simona Ballardini scored 17 points for Italy. Romania notched up their second win with a comfortable victory (80-49) against Finland to the satisfaction of their home fans. Finland had the better start and led (16-9) after eight minutes and edged the first period (16-14). However Romania had begun to take control. The hosts kept Finland scoreless for the first five minutes of the second period and completed an 18-0 run to take command of the match (27-16). Finland managed to hold on for the rest of the second quarter and went into the locker room 15 points down (29-44). A 10-0 start by Romania in the third period more or less ended the game as a contest (54-29) after 27 minutes. Maria Pascalau led the scoring for Romania with 21 points and 11 rebounds. For the guests Niina Laaksonen was the best player with 11 points. In the other relegation match Great Britain, playing in Sheffield, had no problems in defeating Bosnia and Herzegovina (91-58). Rosalee Mason led the Great Britain in scoring with 17 points. She was joined by four other players in double digits. For Bosnia and Herzegovina Natasa Mikic scored 27 points. Great Britain and Romania remain unbeaten and will play against each other on Saturday.